Here is a thriller which at first sight seems to be pretty much cut and dried as far as what has happened and who the killer is, but all may not be quite as it seems. After all if we start the play with the murder and the person responsible, there is only way to go, and that is backwards, and then all of the mystery about the story has gone. Or has it? Diane’s husband, Paul, has been shot, which she discovers after being escorted back from the opera by Chief Constable Bligh and ex con Charley Mirren is standing over the body, the gun still in his hand. Jessica Bligh believes that this is not quite as open and shut as it first seems, and takes us back over the events that led up to this cunning thriller, and if Mirren didn’t do it, why was he there, and who did do it? Debbie Blake plays our sleuth, Jessica Bligh, and what a great sleuth she makes, Always in the back of her mind that something was not quite right about this obvious situation, she slowly uses cunning to unravel the clues to uncover the truth. I love that Debbie acts with the whole of her body, making us believe every action and line she delivers. Paul Langston pitches the character of Inspector Fremont, just right. Impatient to get on with the case and lock up Mirren, guilty or not. Lovely characterisation with Paul's acting. Rob Jackson, for me delivered one of his best performances as would be killer Charley Mirren. So used to seeing him play comedic roles, this serious part was a lovely eye opener for me and showed another side to his acting skills. Gary Frost is another of Beeston Players regulars who absolutely stepped up his game playing the part of Hugo. This character is a departure from the normal comedy roles I've sen him plat, and again, same as Rob, shows a completely different side to his skills, and I like it! Sarah Murray is, I think, a new name to me. Sarah played the widow Diane, and has a wonderful scream on her. An easy watch and can't wait to see what she does next. Kevin Fairbrother manages to get himself killed off quite early on, well his character, Paul, under a case of possible mistaken identity, all adding to the twists and turns of Clemens' plot. Alison Williams, again another new face to me, I think, and plays a very convincing WPC as Constable Walters. Directed by Larraine Maddison, this is a big success. It was pacy and all the characters were well rounded, and with all the twists and turns in this play, the atmosphere was electric. Sometimes the flashbacks in a live play can be a bit confusing, but not with this one. They were really well executed. As always there is a solid creative and production team behind the scenes keeping the show rolling on with well greased wheels. Fiona Maxwell and Tom Jenkins (Lighting), Sam Williams and Nina Tunnicliffe (Sound), Barbara Barton (Producer), Sue Frost (Stage manager) with Ian Greatorex (Assistant Stage Manager). The set was designed by Sam Williams and there was a good use of props (Alison Williams and Gwen Murray). Hair and make up was by Maxine Taylor. Beeston Players, now in their 50th year, really do come across as one big family and this is also borne out by the wonderfully friendly front of house staff who provide the complimentary tea and coffee, work the pop up bar, sell raffle tickets and generally make you feel really at home. Every year they seem to build on their previous reputation, but this production really raises their bar quality wise, so go and support your local theatre who really do produce some amazing live entertainment throughout the counties. 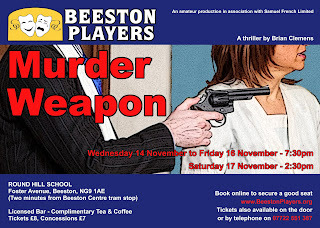 “Murder Weapon” is at Round Hill School, Foster Avenue, Beeston until Saturday afternoon. The matinee on that day starts at 2.30.